NASA’s Juno spacecraft is just a few days shy of its arrival at the solar system’s biggest planet. The highly-anticipated mission, is about to take a peek into the real nature of Jupiter, hopefully providing new insights about the structure of this gaseous giant. Juno could be on the verge of redefining our current knowledge about what lies deep beneath Jupiter’s thick and violent atmosphere. One of the questions still perplexing scientists that could be answered by Juno, is how much water resides inside this enormous planet? The Jupiter-bound spacecraft will seek for answers by flying over the gas giant in a polar orbit. It will probe beneath the planet’s obscuring atmosphere to learn more about the Jupiter’s origins and structure. “Several key questions about Jupiter - like how much water is there inside Jupiter? - require getting very close and passing over the poles,” Fran Bagenal of the University of Colorado, Boulder, leader of Juno’s Magnetospheric Working Group, told Astrowatch.net. “Jupiter emits heat in the form of microwaves. As we all know from heating up tea, water absorbs microwaves. So by mapping the absorption of microwaves in six different bands, we will map out the distribution of water and ammonia in the atmosphere,” she said. Secrets of the Jupiter’s interior structure could be unlocked by a probe orbiting it very close and passing over the poles. That’s why Juno, during its mission, is expected to perform a series of 37 close approaches to the gaseous planet, that could result in new insights on what lies beneath thick Jovian clouds. Scientists hope that Juno will be able to measure the detailed structure of the gravitational and magnetic fields and map as much of the planet as possible. “Juno and its orbit are designed to determine Jupiter’s gravitational and magnetic fields to very high accuracy, which should allow answers to important questions about interior structure such as ‘is there a core?’, ‘where is the magnetic field generated?’, and ‘is oxygen enriched like other elements heavier then helium?’” Randy Gladstone, principal investigator of Juno’s Ultraviolet Imaging Spectrograph (UVS) at the Southwest Research Institute (SwRI), told SpaceFlight Insider. Juno will study Jupiter from a highly elliptical orbit, in which the spacecraft will dive down over the north pole, skim the outermost atmosphere, and rise back up over the south pole. This maneuver is expected to last for about six hours and it will be repeated every 11 days. The highly elliptical orbit will also allow the probe to avoid most of the intense particle radiation surrounding the planet and will enable thorough investigation of Jupiter's polar magnetosphere. To study Jupiter magnetic fields, UVS will make spectral images of the planet’s aurora. The spectrograph is sensitive to both extreme and far ultraviolet light that will characterize the morphology and spectral nature of auroral emissions. “By passing over the polar regions for the first time, Juno will be able to directly measure the charged particles that bombard the atmosphere and excite the intense aurora that we have observed with Hubble and other Earth-based telescopes. It will test our ideas about auroral processes to see how well our understanding based on experiences at Earth apply at Jupiter,” Bagenal said. She hopes that Juno’s measurements will teach us about the physics of space, what could be important for the commercial and other satellites we have up there, current and future. Jupiter is made primarily of hydrogen and researchers believe that inside the planet there is an abundance of liquid metallic hydrogen - a phase of hydrogen in which it behaves as an electrical conductor. Deep inside this giant planet, an intense atmospheric pressure turns the gas into a dense fluid. When the pressure becomes extreme, it squeezes the electrons out of the hydrogen atoms and the fluid starts to conduct like a metal. The liquid metallic hydrogen inside Jupiter transforms the planet into an enormous generator. Due to this process, Jupiter's magnetosphere produces auroras that light up the planet’s poles more brightly than any other planet. Few theories about Jupiter’s origin that are currently taken into account, predict that the planet’s interior could also harbor water. Juno should be able to yield new information about the planet’s possible watery interior. “Juno will be exploring the interior structure of Jupiter, which we need to understand in order to test theories of solar system formation - and particularly the formation of gas giant planets,” Bagenal noted. Juno could surpass the achievements of a previous mission to Jupiter, called Galileo, which arrived at the planet in 1995. It was the first spacecraft to orbit Jupiter and it conducted intensive studies of the gas giant and its moons. It investigated the planet’s atmospheric composition and ammonia clouds, revealed the composition of its faint ring system and mapped the extent and structure of its magnetosphere. Juno could be more effective than Galileo, as it benefits from improvements in technology since its predecessor, and has much more focused science goals than that earlier mission. 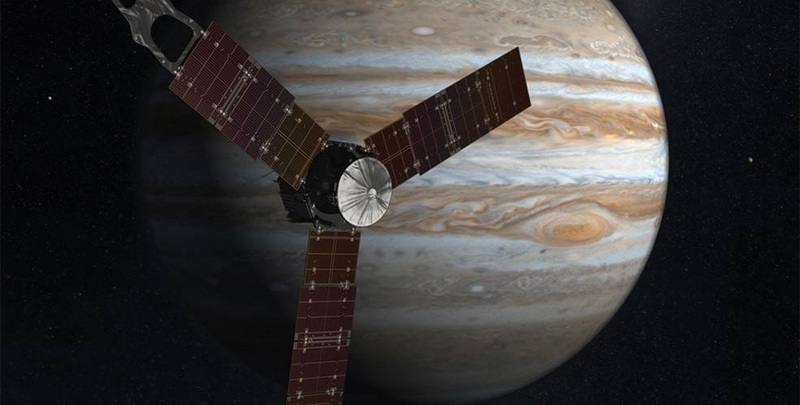 “Hard to say right now if we will surpass Galileo’s achievements, but I expect Juno data will result in a lot of exciting new science results,” Gladstone said. One thing is for sure - Juno is all about understanding gas giants. Jupiter is their archetype, after all, and to understand them, we need to understand Jupiter. The Juno spacecraft was launched on Aug. 5, 2011, from Cape Canaveral, Florida. It is slated to arrive at Jupiter on July 4. NASA’s Jet Propulsion Laboratory (JPL) manages the Juno mission for the principal investigator, Scott Bolton, of SwRI in San Antonio. Juno is part of NASA's New Frontiers Program, which is managed at NASA's Marshall Space Flight Center in Huntsville, Alabama, for NASA's Science Mission Directorate.